Watercress and Rocket Pesto is an alternative to the classic pesto, with lots of health benefits. It is great in pasta, or as a dressing to salads, over baked potatoes, or spread over toasted baguette slices. Remember when I made that awesome Salad with rocket and fresh kardamon (watercress) (Nasturtium officinale) a few weeks back? Well after making a couple more salads everyday, there was still some watercress and rocket left. Although I loved the salads I didn’t want to eat any more so I decided to make a pesto with what was left and see how it works. When I finished it, I tried just a little bit to see how it turned out. Again, the flavour of the watercress and the rocket (arugula) was very strong and peppery and I had to add something in to balance it. The only thing I had at home and could use were frozen peppers (I always have some in the deep freezer, just in case I need some). I added and tasted, added and tasted and YES, finally it was perfect. 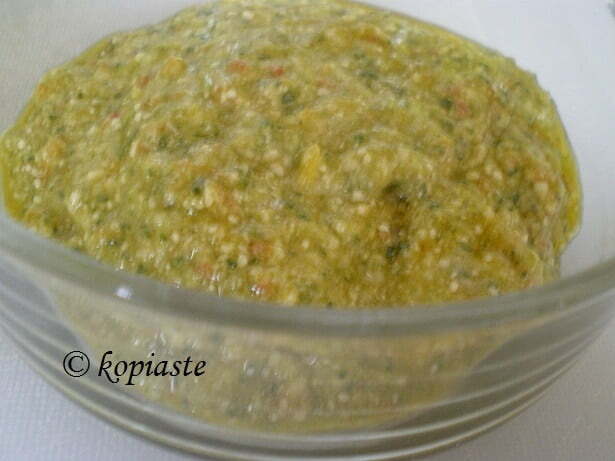 I made this pesto a week ago and used it in a few recipes. Today I made the last one and hope to find some fresh kardamom again so that I can make some more soon. However, as all of you commented that you could not find any fresh cardamom, I believe that even if you use only the rocket it will still taste awesome. I am submitting this recipe to Sweetnicks, who is hosting this week’s Weekend Herb Blogging, created by Kalyn of Kalyn’s Kitchen. Wash and drain the rocket and watercres. Combine them in with the pine nuts and some olive oil and pulse a few times in a food processor. Add the peppers, the vinegar, garlic and salt and pepper and pulse a few times more. Slowly add the remaining olive oil in a constant stream while the food processor is on. Stop to scrape down the sides of the food processor with a rubber spatula. Add the cheese and pulse again until blended. Add a pinch of salt and freshly ground black pepper to taste. Val, I keep forgetting to mention that rocket is called arugula in the States. Yesterday I made a pasta salad as well with the last of the pesto which I will post soon. Great idea! Love the combination! How daring Ivy!!! Great that you got the exact measures for every ingredient!!!! It sounds like a great pesto to me. This pesto sounds amazing! I’m excited to give it a try. Do you recommend anything other than pasta? I want to put it on some fish or shrimp and bake — a whitefish maybe? Hi Trisha. Thanks for visiting. It sounds like a good idea to use it on whitefish and shrimps. Actually I used it in a navy beans salad instead of using oil and it was very good. I shall post about it very soon.